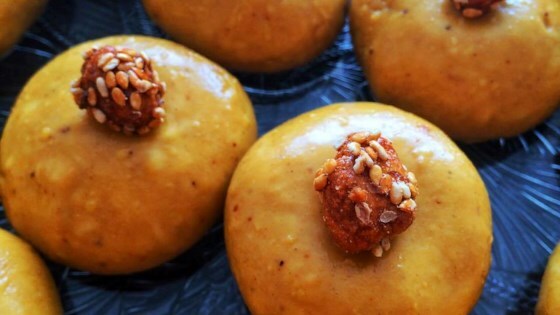 "If you are like me and like the taste of besan in sweets, then you will love Besan Laddu. What is even better is that it is very easy to make and it keeps well for many days. Not that it will last that long." Heat the ghee in a skillet over medium-low heat. Stir the chickpea flour into the ghee and cook until golden brown and has a nutty smell. You cannot miss the fragrance of roasted besan. It will perfume the entire house. Turn off the heat and let the besan cool till just warm. Stir the confectioners' sugar and cardamom into the flour mixture. Pinch the mixture together with your fingers. It should hold the shape. If not, sprinkle some milk till the mixture is able to bind together. Form the mixture into lime-sized balls and roll between your palms till smooth and even. Serve. A must-have sweetener. It’s not called “simple” for nothing. i like it a lot , because it was easy to make and i did add little food color in it , to make it look good too.